ProForm Power 995 treadmill features a powerful and innovative design that will get you into shape in no time. The Power 995 delivers revolutionary technology and cutting-edge features for superior fitness results. The ProForm Power 995 treadmill features workouts Powered by Google Maps, training with Jillian Michaels, iFit Live compatibility and automatic speed and incline controls. This wireless technology delivers smarter workouts and faster results and the Power 995 is also compatible with Nike + iPod. Simply connect your iPod, work out and then sync your results online at Nikeplus.com. Other top features include a powerful 2.75 CHP Mach Z Commercial Plus Motor, comfortable ProShox Elite 2 Cushioning and an extra-long 20″ x 60″ treadbelt. ProShox Elite 2 Cushioning: The air-based, shock cushioning system reduces impact on your joints and delivers a more comfortable running surface. SpaceSaver Design with EasyLift Assist: This patented, revolutionary design allows your treadmill to fold vertically for storage. 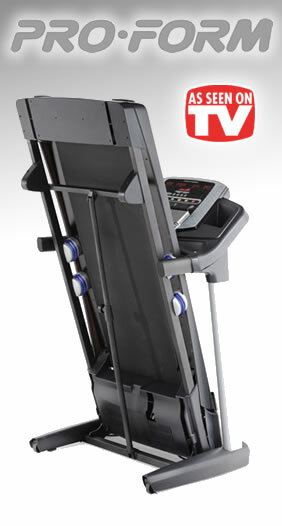 To make it even easier, this treadmill includes a powerful shock that will help lift the deck with an easy push. Dual-Grip EKG Heart Rate Monitor: Make the most out of every workout by monitoring your heart rate with these built-in handlebar sensors. They will ensure you are in the right training zone for your goals. Multi-Window LED Display: LED displays are easier to read than LCD’s and make keeping track of your workout that much better. This display tracks your speed, time, distance, incline, pulse and calories burned so you can monitor your progress throughout your workout. 20 Built-In Workout Apps: Get the workout you want with 20 built-in workout apps designed by a Certified Personal Trainer. 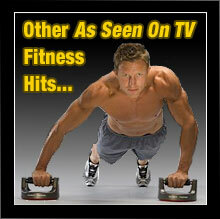 Choose from 5 speed, 5 endurance, 5 weight loss and 5 calorie burn workouts to get the results you want! The simple navigation makes it quick and easy to pick your workout and get going! Nike + iPod Compatible: Track your performance by simply connecting your iPod to the treadmill. Work out and then sync your results online at Nikeplus.com to easily follow your workout progress! 2.75 CHP Mach Z Commercial Plus Motor: The Mach Z Commercial Plus Motor uses direct cooling, a self-cooling process that extends the motor’s life and allows you to exercise for longer periods of time. The Mach Z is also spin-balanced, making it one of ProForm’s smoothest, quietest motors to date. 0-15% Quick Incline: The best and most convenient incline adjustment, Quick Incline allows you to change the incline with the single touch of a button instead of tediously scrolling through options as you would with traditional incline controls. 0-12 MPH QuickSpeed which allows you to instantly change the speed of the treadmill between 0–12 MPH with the single touch of a button. Supports user weight of up to 350 lbs. Warranty: The ProForm Power 995 is protected with a Lifetime Motor Warranty, Lifetime Frame Warranty, 3-Year Parts Warranty and 1-Year Labor Warranty. The ProForm Power 995 treadmill is an exceptional and full-featured exercise solution that is designed to provide you with a vigorous and superior quality workout. The Power 995 treadmill from ProForm will have you getting fit and dropping those extra pounds before you know it. If you’re serious about getting into shape and staying that way ProForm offers the answer you’ve been looking for. What are you waiting for? 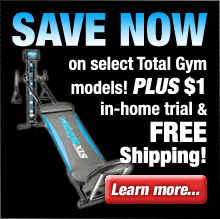 Order a ProForm Power 995 treadmill and get ready to get into the best shape of your life.